The Scanning Electron Microscope is a basic instrument for analysis and characterization. We will cover the basic configuration of the electron guns in this article. Scanning Electron Microscopes (SEMs) fall into three basic configurations, Tungsten, Lanthanum Hexaboride or LaB6 and field emission. Within the field emission category, there are two basic configurations: the cold cathode configuration and the Schottky Emitter configuration. Figure 1 shows the basics of a tungsten-based system. In a standard tungsten system, a bias is placed across the filament; the current through the filament heats it. At high temperatures the material emits electrons, which can then be accelerated down the column. 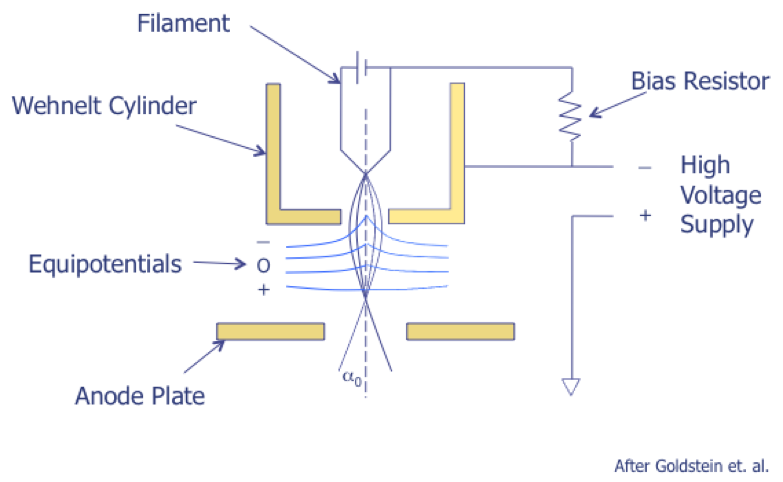 The high voltage power supply between the Wehnelt cylinder, filament, and anode plate determines the primary electron beam energy. 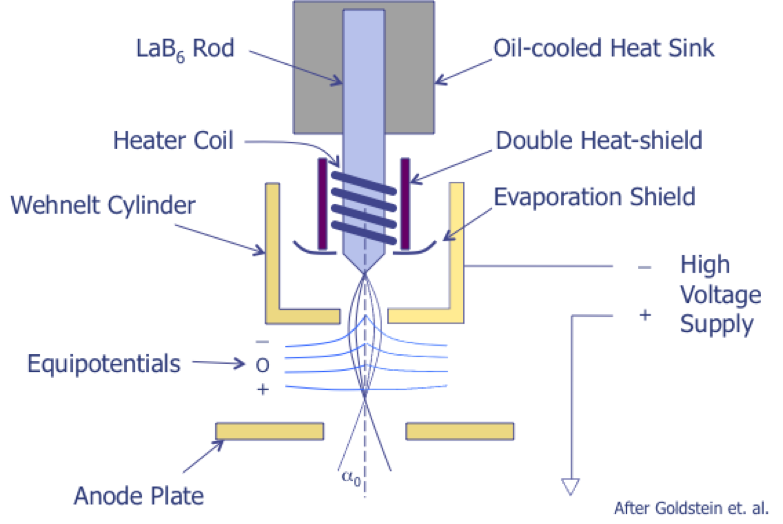 Figure 1, Diagram showing a tungsten emission electron gun. Figure 2 shows the basics of a lanthanum hexaboride system. Lanthanum hexaboride, also known as LaB6, emits a higher number of electrons than a tungsten filament, permitting higher quality images. In this gun configuration, a heating coil encompasses the LaB6 rod to heat it. As with the tungsten system, the high voltage power supply lies between the Wehnelt cylinder and anode plate to determine the primary electron beam energy. Figure 2, Diagram showing a LaB6 electron gun. Another method for generating electrons is the field emission gun. A schematic of a field emission tip is shown in Figure 3. When the cathode forms a very sharp tip (typically 100 nm or less) and the cathode is placed at a negative potential with respect to the first anode so that the local field at the tip is very strong (greater than 10 to the 7 Volts per centimeter), electrons can tunnel through the potential barrier and become free. Although the total current is lower than either the tungsten or the LaB6 emitters, the current density is between 10 to the 3 and 10 to the 6 Amps per centimeter. Thus, the field emission gun is hundreds of times brighter than a thermionic emission source. Furthermore, since the electrons are field generated rather than thermally generated, the tip remains at room temperature. Tips are usually made from tungsten etched in the <111> plane to generate the lowest work function. Because a native oxide will quickly form on the tip even at moderate vacuum levels (10 µPa), a high vacuum system (10 nPa) is needed. To keep the tip diameter sufficiently small, the cathode is warmed to 800-1000 °C or rapidly heated to approximately 2000 °C for a few seconds to blow off material. 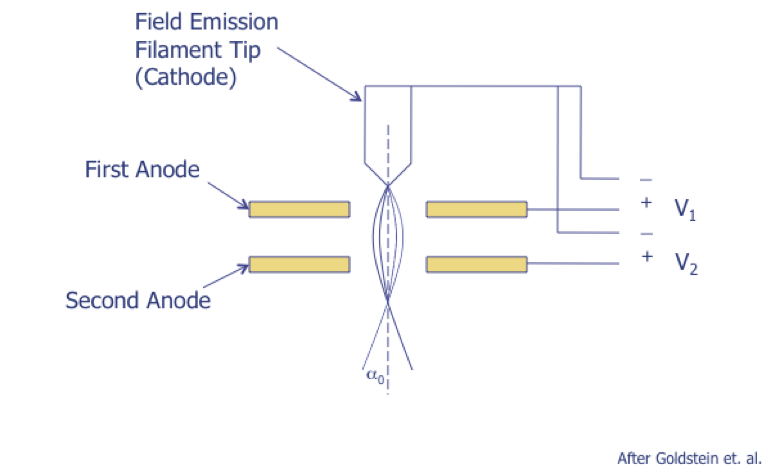 Figure 3, Diagram showing a field emission electron gun. Table 1, Summary of scanning electron microscope electron guns and their capabilities. This table summarizes the basic capabilities of the four basic configurations, where we break the cold field emission and Schottky field emission systems into their own separate groups. The highest performers are the field emission systems, which include cold cathode and Schottky. The high brightness and sharp tip leads to high resolution and longer source lifetimes. Notice that both tungsten and LaB6 have lower brightness, lower resolution, and reduced source lifetimes. However, the lower vacuum requirements can facilitate more rapid sample exchange, especially when venting the column is necessary. For more information on the Cold Cathode and Schottky field emission systems, please see the Technical Tidbit on this topic elsewhere in this newsletter. Sometimes, analysts ask whether they should purchase a Cold Cathode or a Schottky cathode field emission SEM. Although the cold cathode and Schottky cathode field emission systems both have excellent resolution, there are some differences between the two configurations. The cold cathode performance is achieved through a sharp tungsten tip. The sharp tip leads to a very high brightness, which in turn leads to higher resolution at low accelerating voltages. Cold field emission gives best images, but these sources are sensitive to gas atoms in the chamber so vacuum must be better, which increases cost of system. The current can be unstable, so Cold Field Emission doesn’t work well for certain applications like energy dispersive x-ray analysis. The low energy spread reduces chromatic aberration, leading to the highest quality images. The Schottky field emission uses thermal assistance. This reduces performance slightly but gives a more stable beam, making it a better choice for applications that require higher current. Some Schottky emitters use zirconium oxide coated tips to reduce the energy barrier at higher temperatures. 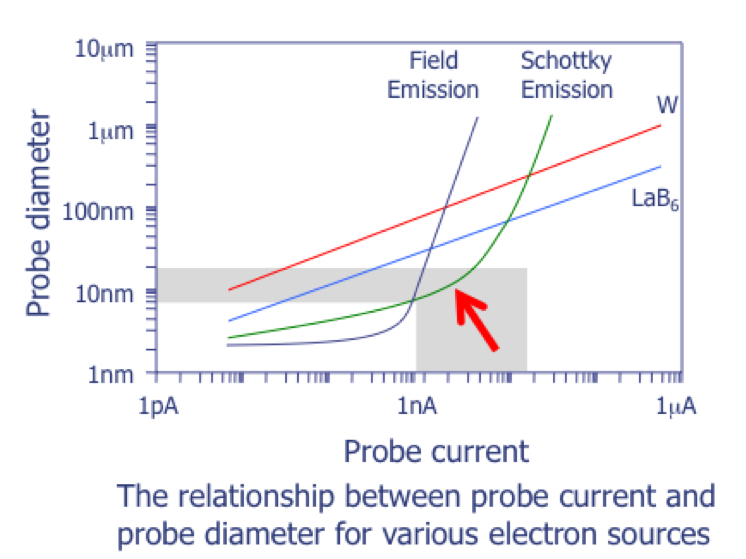 Notice the lower probe diameter at higher beam currents for the Schottky emission configuration (indicated by the red arrow). Q: Is there a standard for SEU testing? A: Yes there is. JEDEC issued JESD-89 in 2007 to cover SEU testing. There are several parts to the document; be sure to read each one so you know how to apply the testing to your situation.